With better discovery by investors, this mispricing should reduce going forward. The gap can reduce to 50% of NAV like in other holding cos. If so, the stock has potential to reach Rs 125-150+ in long term. Another positive factor in this stock is – that it is listed both on NSE & BSE and has decent liquidity unlike other small holding cos (which are illiquid). Also, CHI Investments has investments in cos which are related to power sector and have high growth plans. With increasing media coverage and shareholders, the risk of unjust merger is also getting reduced. The company is all set to emerge as the biggest & dedicated player in the Oncology segment. The company has fantastic operating margins of 25-30% and the company is growing @ 30%+. For co’s growing at such pace with such high margins, the PE multiples could be in the range of 15-20. If so, price target of Rs 200 can be achievedJ. The company is expected to receive USFDA approval by the end of this year. Apart from that, we are awaiting the annual report of the company and looking for industry/market updates. Chip in your updates, if any. Have a look at this small sized pharma company which has been performing very consistently over the years yet the valuations are cheap. At CMP of 75, the stock is trading at less than 6 times FY 09 EPS of 13.2 and much less than the BV of 100+. 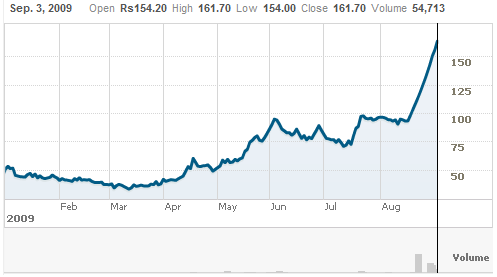 The company has a good dividend track record and paid a dividend of 35% last year hence giving a div yield of 5%. Company though not aggressive yet is a slow and steady performer with clean balance sheet. They did major upgradation, expansion and modernization of their facilities a year back and the positive effects should be seen in coming quarter nos. They have very strong cash flow as the company is very disciplined on the Inventories and Debtors position. Their Q1 nos were pretty good and if they repeat or improve the same, the company should be able to post an EPS of 17-20 for FY 10 and stock has potential to give 50-100% in a year. This is one of the stock ideas in which one can lock his profits . Working on the above advice, we all will agree that the next big opportunity is in the Gas Sector. Early beneficiaries will surely be “pipe line laying” companies. Jaihind Projects (JPL) is a leading player in this space and is scaling up very aggressively. I have been bullish on JPL for quite some time and feel that there is enough potential. It is only listed dedicated player available in this space. Company has been doing this work for major PSUs such as Gail, IOC, GSPL etc for several years. Gail, GSPL etc have ambitious targets for building pipeline network across India, JPL should surely gets its share in future orders. The company has grown from just 50 Cr turnover in 2005 to 325 Cr turnover last year. Company is expected to achieve a turnover of atleast 500 Cr+ this year and if they are able to maintain their historical operating margins at around 12%, the company has potential to achieve Net Profit of atleast 20-25 Cr. Which will result into an EPS of say 20-25 on an expanded equity of close to 10 Cr. At current market price of less than 100, the forward P/E is less than 5. Considering the things will go well, stock has potential to more than double in two years period. The company has been taking debt to expand so if there are delays, the company can be adversely affected. The company has been diluting equity by issuing shares to promoters on preferential basis. The company doesn’t pays dividend to conserve cash for growth. Do work out the calculations and share the views. The company has come out with very good June Qtr nos and deserves a closer tracking. Company expects to get USFDA approval by year end. Company has scaled up from just 25 Cr topline in 2003 to 138 Cr last year and targeting close to 200 Cr this year. Margins have been on the rise over the years due to co’s deliberate move from low margin to high margin business. The margins are currently at 25%+…on a turnover of 200 Cr this will result into an operating profit of 50 Cr, from this we should subtract the interest and taxation cost, which shouldn’t be more than 7.5 & 10 Cr respectively. We get a figure of 35 Cr+ as potential cash flow this year and NP could be close to 25 Cr, conservatively. For margins calculations I have been removing the forex adjustments. Last year the company suffered a notional 10.85 Cr forex loss on the outstanding ECB. In this quarter there is a gain of 2.9 Cr. There are some losses in the consolidated nos, as the company did an acquisition in Austria last year. These losses are expected to come down soon. I like companies with scalable business model having high operating margins. Shilpa is growing fast with operating margins expected to remain very healthy around 25%. The company seems honest and has been applying conservative accounting policies. The company has been providing good amount of depreciation and tax at the maximum rate. Currently trading at less than 8 times expected FY 10 EPS of 12 (this EPS is excluding forex gains/losses). Not very cheap but a strong buy on declines. CHI Investments has hit an another upper circuit closing at Rs.44.25. What a wonderful ride it is going on. 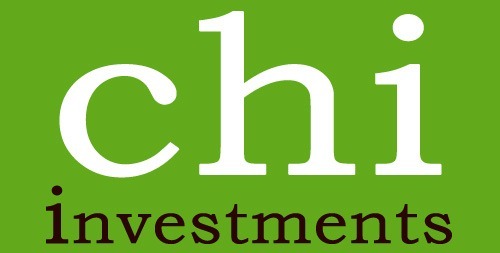 We recommended CHI Investments on 15th May on this blog, when its price was Rs.25. CHI Investments may reach Rs.70 in near future and the old investors should start reducing their average costs (and enter into other value picks). However, we still recommend in holding a major part of the stock for a long term. The real beauty of the stock is that it is still discounted at around 85% as KEC (forming 50% of its portfolio) too has seen a similar price rise. Seeing the recent trend, it wont be hard for the stock to reach the optimum levels and reduce the discounting. Keep circuiting up CHI Investments! CHI Investment receives almost 4-5 Cr as dividend/interest income annually.